Our location in Paderno del Grappa creates an easy gateway to travel Europe. We are just 45 minutes from one of Europe’s leading low-cost airlines in Treviso, the number one hub of Ryanair. Ryanair offers extremely affordable tickets with direct flights to Paris, Brussels, London, Dublin, Budapest, and many more cities. Students also can take overnight trains to Vienna or Munich. Magnificent Views. Amazing Food and Friends. And a Convenient Gateway to Travel Europe! Let’s be honest: it’s hard for CIMBA’s location to get any better. 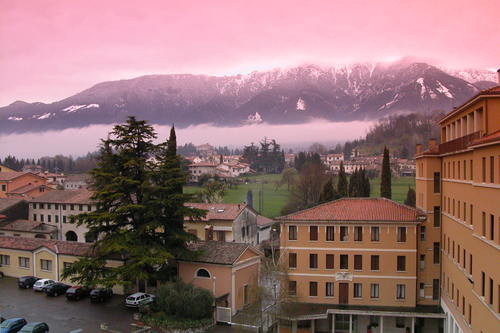 Our campus is in Paderno del Grappa in northern Italy at the base of the Italian Alps—just one hour north of Venice. Our students open their windows each morning to magnificent views of Mount Grappa and the Venetian countryside. Step off campus and you are in the center of an authentic, northern Italian town. Eat dinner with a local family, get to know the shop owner across the street, enjoy a cappuccino at the campus cafe, volunteer in the community, walk through the vineyards surrounding campus, or take a bus to nearby Bassano del Grappa, a city with a rich history that includes the French Revolution Wars, WWI, and WWII. Paderno del Grappa is also in the heart of Italy’s Veneto Region. Revered for its natural beauty and picturesque old-town centers, the region is home to a powerful business community that boasts more than 450,000 companies. The region, with its major cities of Venice, Padua, Vicenza, Verona and Treviso, is home to prominent Italian-borne corporations that have become major exporters, including Benetton, Diesel, NorthFace, Tecnica, and more. Our location and long-standing networks give our students the opportunity to visit these international businesses through company tours. Beyond the Veneto Region, students travel throughout Italy and absorb the rich history, culture and economics of Siena, Florence, Rome and more. 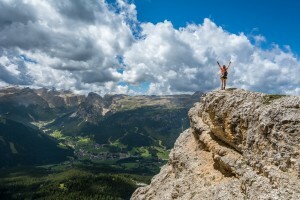 Italy is home to one of the ten largest economies in the world, making it an ideal place to immerse oneself not only in art, politics, but also in international business.